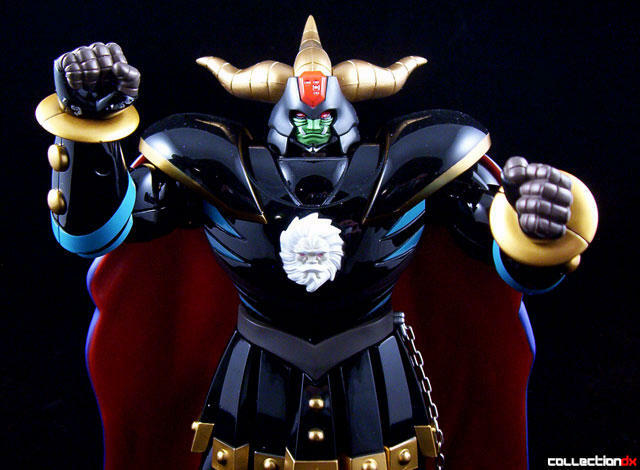 Ankoku Daishogun was the 11th entry into Aoshima's Shin Seiki Gokin line of diecast action figures and represents the updated version of the classic Great Mazinger villain. This line is noted for having toys that have a tremendous amount of diecast content and this piece is no exception. What it lacks in gimmicks, it more than makes up for in sheer size and weight. At approximately 10" tall and 2.25lbs, this is one big hunk o'metal! This toy appeals to me alot for a few reasons. Besides it's massive size, I'm immediately drawn to the fact that it is a diecast version of a villain character. And though many people like all sorts of fancy gimmicks, combinations and transformations with their diecast toys, none of that interests me very much. This toy is simple and I like it all the more for it. You can pretty much play with or display this right out of the box. The only thing you need to do is add fists (3 separate pairs are included to chose from), attach the cape if desired and snap on the shoulder pads. All the parts go on and off with ease. The cape is a great addition, giving the character an air of malevolent royalty. To connect it, you must line it up with the holes on the back and slide a plastic piece into them. A big round piece connects to the figure while the smaller, flat piece goes through the cape, holding it in place. Very simple. Next, just pop the small, metal rods inside the shoulder pads inbetween the two tabs on the shoulders and you're good to go. The tabs on the shoulders appear to be fragile, but I haven't had any problems with them, nor have I read of anyone else's breaking. Of course, I use caution when adding/removing the shoulder pads just to be on the safe side. Each section of the skirt is a separately molded and separately attached piece of plastic. It makes for a nicer look as well as a better range of mobility in the hip joints. On my specimen though, the paint in this area chipped very easily. I honestly don't even remember doing anything that might have caused it and it's possible it might have even been that way right out of the box. Fortunately, I reallly don't care too much. 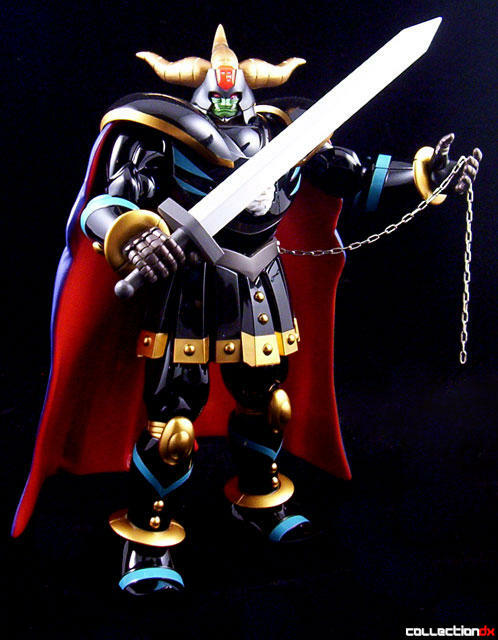 Ankoku Daishogun comes with just one weapon, a large sword that he can hold in either hand, provided you've attached the correct fists. There is a sheath for this sword and it it is the only point of contention I have with the toy. There is no place to connect it to the toy, such as on the waist. He must simply carry it around. A large chain hangs from the left side of his waist, but it seems to be nothing more than window dressing. It doesn't connect to or hold anything in particular. 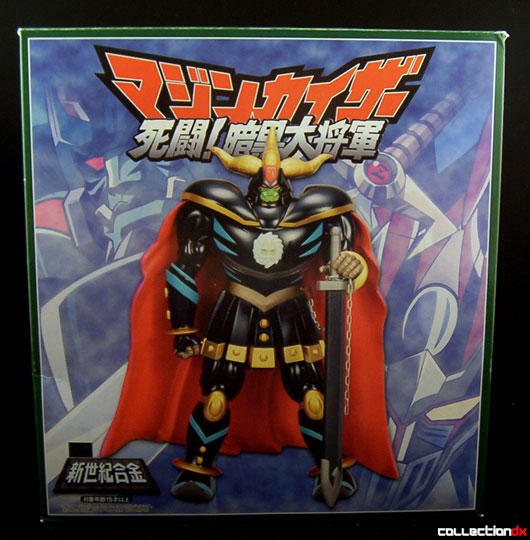 Ankoku Daishogun was released in at least 3 different versions. 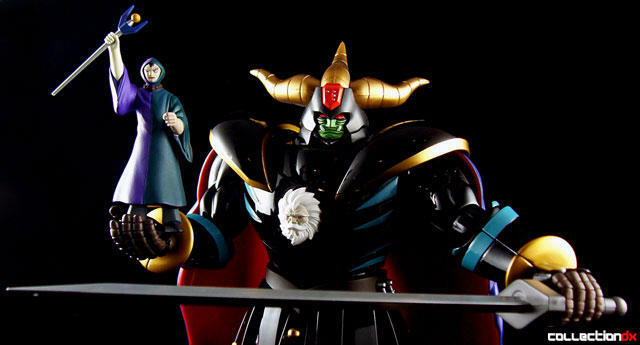 The regular version (reviewed here) comes with a a miniature figure of the character of Baron Ashura, while the obligatory black version has a metallic finish and comes with a miniature figure of Dr. Hell. 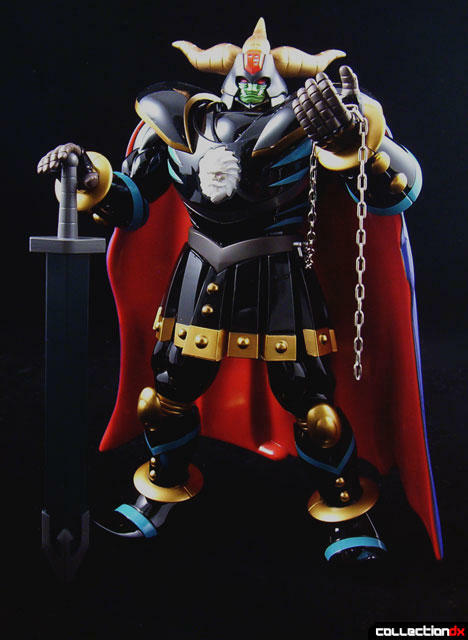 A third release was a limited Anime Export exclusive TV version with anime accurate colors and a miniature figure of Duke Gorgon included. I really like this toy alot, but if you like lots of gimmicks and high-tech engineering in your gokin, then you can probably look elsewhere. But if you want something with some sheer "presence" on your diecast shelf, this is a great piece to get. I picked one up for a good deal recently after waiting for a decent price going on 5 years at least. I really like this release and it is stunning in weight and pure evil. The only issue now is I want the second/new sculpt Aoshima release after seeing how much better scale the head looks on his chest. You MUST have at least one or two evil gokins in the lineup-minimum-and this is the top dog.